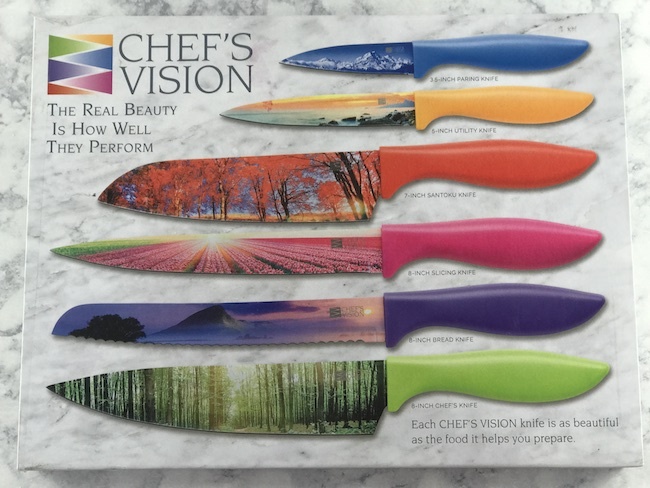 I received the Chef’s Vision Knife Set in order to facilitate my review. All opinions are my own and may differ from yours. 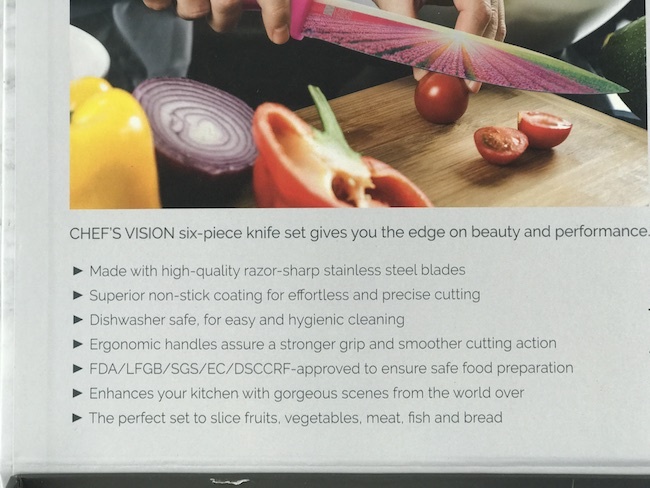 Chef’s Vision Knife Set Review! I absolutely adore being able to create in my kitchen. From the time I was small and able to help my female relatives whip up recipes, I’ve loved the peace and sense of accomplishment that comes with finding and putting together recipes for my family and friends. On an average day, I cook between 2 to 3 meals but when I’m really in the mood to let loose in the kitchen, I’ll spend an entire day browsing the internet for interesting recipes and trying my hand at perfecting them. Cookies, cupcakes, and breads are some of my favorite things to whip up but I do love cooking meals for my family as well. When I was growing up and finally reached the point where I was trusted to help in the kitchen, my mom taught me a valuable lesson: you can cook instant food all day long but you can’t cook real food without a good set of kitchen knives. Even though this was drilled into my head from that point on, I tried to make do without a good set of knives early on in adulthood and quickly learned how right mom really was! Now, I have a set of chefs knives that I love but didn’t hesitate when the opportunity to review a new set came along. Especially since this particular set was just too darn pretty to pass up! The Chef’s Vision is one of the prettiest knife sets that I’ve seen. Of course, even the standard sets, without additional frills and images, are pretty to me but these are definitely a new favorite of mine. 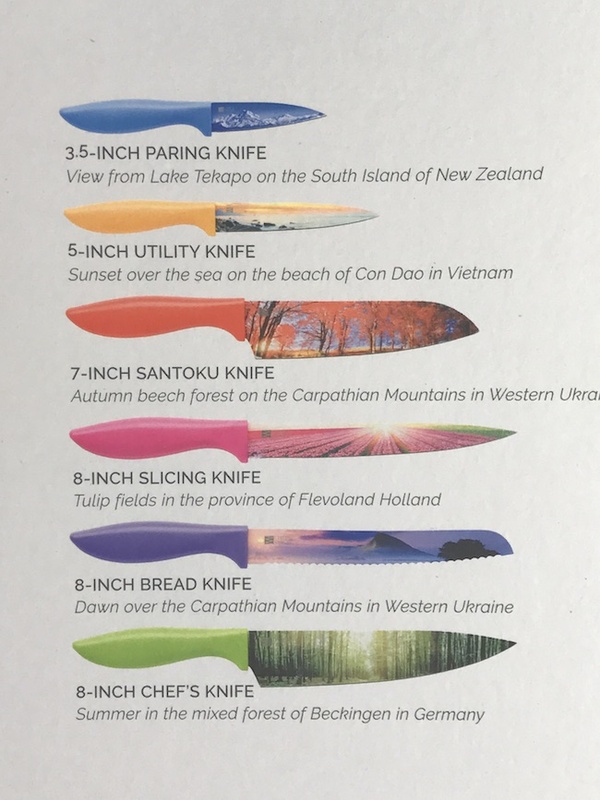 Not only are they just gorgeous thanks to the scenic images printed on the blades but they’re also incredibly sharp, which comes in handy when you’re slicing meats, breads, fruits, cheeses, etc. The Chef’s Vision 6 Piece set is a wonderful gift for any occasion including weddings, house warming, birthdays or even as a just because gift for yourself. No matter who you happen to be buying this set for, they’re guaranteed to love it. 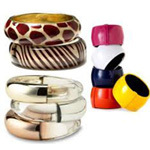 Ergonomic Handles to ensure that you get a stronger grip and easier cutting experience. Non-Stick Color Coating to help release thin slices and cut through food without bits getting stuck. 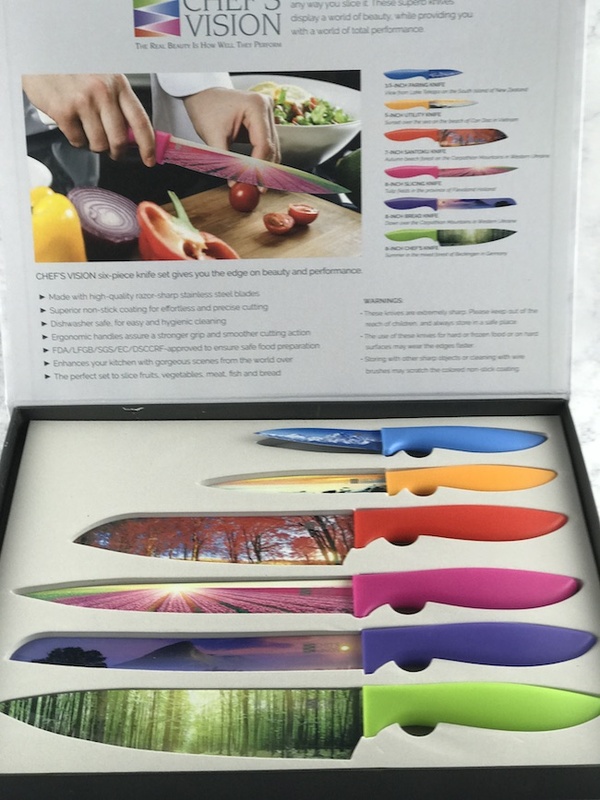 If you’re in the market for a new knife set or know a friend who enjoys cooking who needs to update their old set, then the Chef’s Vision 6 Piece Color Landscape Knife Set is the perfect one to suggest or buy as a surprise gift. 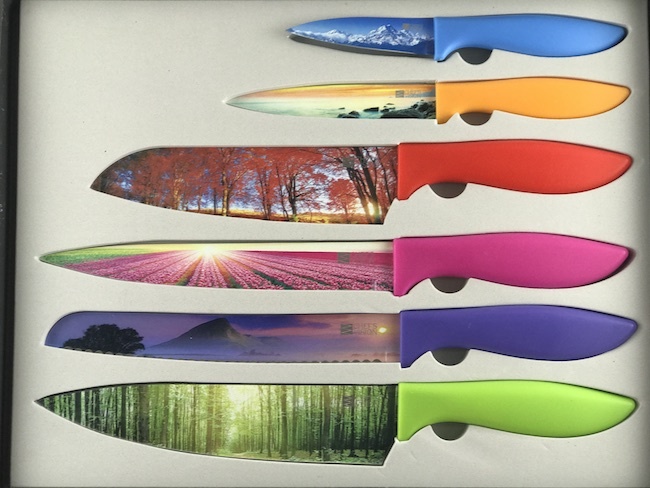 The scenes printed on the blades are just lovely and the knives themselves are razor sharp, so, you can do your food prep precisely and easily! I just hand wash mine.